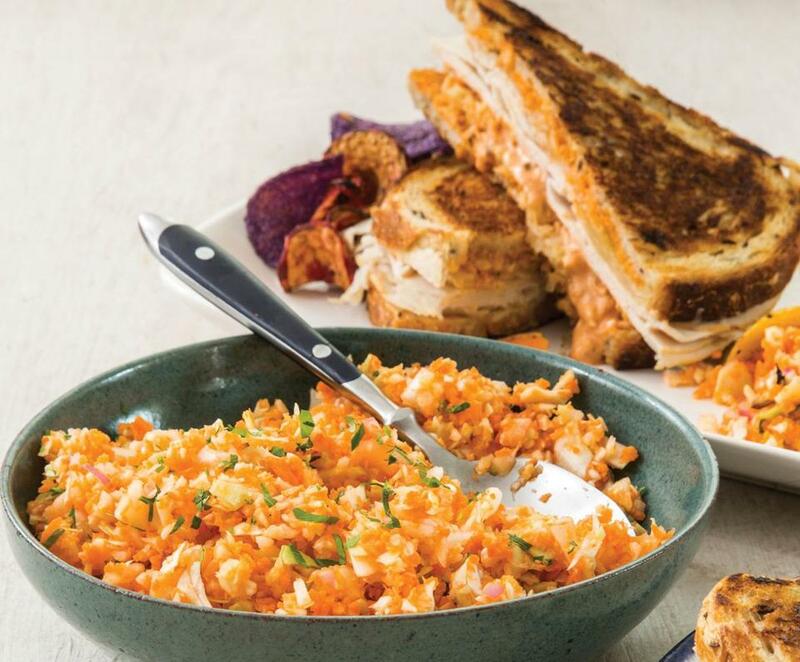 Save some Thanksgiving turkey for a variation on a classic Reuben sandwich accompanied by an unusual — and unusually good — slaw. Turkey Reuben Sandwiches and Tangy-Sweet Carrot and Cabbage ‘Slaw,’ The Cupboard Cafe-Style. Once I’m finally hungry again after Thanksgiving dinner, my first order of business with the leftovers will be making a turkey Reuben inspired by a sandwich I had over the summer at The Cupboard Cafe in New Harbor, Maine. It’s a favorite lunch spot and purveyor of the best fish chowder I’ve ever had. The Cupboard’s Reuben came with a side of an unusual sweet-tart “slaw,” which I loved and have approximated here. Why the quotation marks? It tasted but didn’t look like slaw — the cabbage and carrots were very finely chopped, not shredded; the mix was heavy on the carrots; and the dressing was sweet-tart. It was as terrific as it was unique. Reubens are traditionally made with corned beef or pastrami and, more often than not, Russian dressing, but I prefer the mellower flavor of Thousand Island with turkey. Real roasted turkey is best by far, but you can use deli turkey and the sandwich will still hit the spot. Toasting four sandwiches at once is most efficient in the oven; if you’re making fewer, you can easily use an electric panini press or a skillet (preferably well-seasoned cast iron) on medium-low stove-top heat, with a moderately heavy weight — another skillet works well — on the sandwiches as they toast, for about 4 minutes per side. With the rack in the middle position, heat the oven to 425 degrees. Spread four slices of bread with about 1½ teaspoons butter each and place them, buttered sides down, on a large baking sheet. Spread each with about 1 tablespoon dressing and top each with one-quarter of the sauerkraut and about 4 slices (¼ pound) of turkey. Distribute the cheese evenly among the sandwiches, leaving a roughly ½ inch border around the edges. Spread each of the remaining four slices of bread with about 1 tablespoon of the remaining dressing; top each sandwich with a slice, dressing side down, pressed firmly into place. Spread the tops with about 1½ teaspoons each of the remaining butter. Place another baking sheet over them, and a heavy ovenproof skillet on top of the top baking sheet. Carefully transfer to the oven and bake until the bottom bread slices are lightly browned and crisp, about 9 minutes. Working carefully, turn the sandwiches over, reassemble the weight, and continue baking until the bottoms are lightly browned and crisp, about 9 minutes longer. Remove the sandwiches from the baking sheet, cool for 3 to 5 minutes, cut them in half if desired, and serve at once. Russian versus Thousand Island dressing isn’t the only question swirling around the Reuben sandwich; its origin is also a subject of debate. 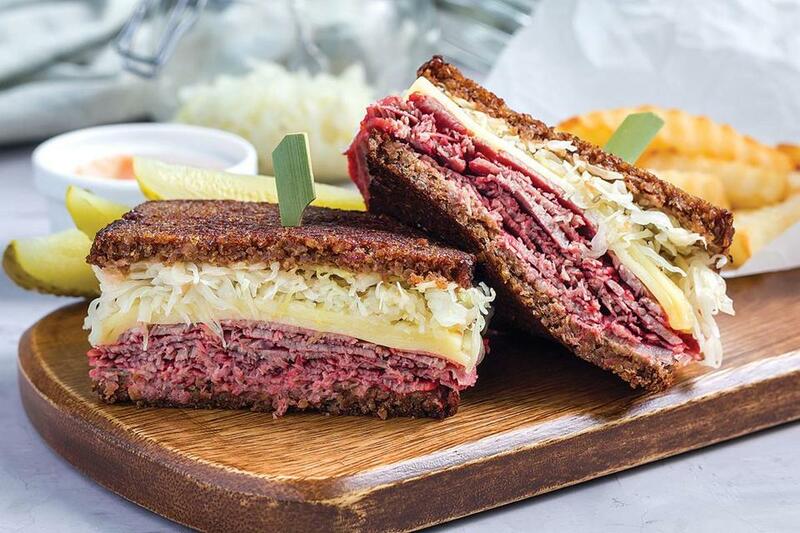 One legend credits the sandwich to Arnold Reuben, the owner of Reuben’s Restaurant in New York City, and dates it to around 1914. Another story attributes it to players in a regular poker game at the Blackstone Hotel in Omaha, Nebraska, in the 1920s. That story centers on Reuben Kulakofsky, co-owner of Omaha’s Central Market, and Blackstone owner Charles Schimmel, who put the sandwich on the hotel menu. In a medium bowl, whisk the first 7 ingredients, ½ teaspoon salt, and pepper to taste until well blended and uniform. Adjust the seasoning with salt and pepper if necessary. Use the dressing to make Reubens, or cover and refrigerate it for up to 3 days. One of The Cupboard Cafe’s owners, Mary Dee Grant, says this slaw originated with her grandfather Claude P. Crocker, an oil tanker captain whose home port was Boston. I hope he would be pleased with my version. In a large bowl, whisk the vinegar, honey, ¾ teaspoon salt, and pepper to taste to dissolve the honey and salt. Vigorously whisk in the olive oil to blend. Adjust the seasoning with salt and pepper if necessary. In a food processor, pulse the carrots to begin breaking down the pieces, about four 2-second pulses. Add the cabbage and pulse until both the carrots and cabbage are very finely chopped but not mushy, 4 to 6 more 2-second pulses. Scrape the mixture into the bowl with the dressing, add the shallots, toss to combine, and set aside to meld the flavors, at least 30 minutes. Add the parsley and toss to combine. Adjust the seasoning with salt and pepper if necessary, and serve. In case you have some leftover cranberry sauce on hand in addition to turkey. Place the ice in the blender and pulse to crush. Add the cranberry sauce and juice, pear, milk, maple syrup, vanilla, and a tiny pinch of salt and puree until the mixture is smooth and moves easily in the blender jar, at least 30 seconds. Pour into glasses and serve at once. Adam Ried appears regularly on “America’s Test Kitchen.” Send comments to cooking@globe.com. Get the best of the magazine’s award-winning stories and features right in your e-mail inbox every Sunday.Sign up here.